After my mother’s parents passed away a few years ago, their children and grandchildren had to sort through all of the stuff that they had stored up in their house. Since they had grown up during the Great Depression and had lived in their final house for nearly two decades, there was understandably a lot of stuff. Much of it lost its meaning or usefulness with their passing, as is sadly often the case, but there were a handful of things that I selected from the piles. One of these items is a pale pink plastic cup that can hold just about exactly a cup of food. We use it everyday to dole out the dog’s food. Another is a set of dishes that were actually my great-grandmother’s. We use these as our regular dishes. This may seem odd, but I think of these things as a memories I get to touch and use. They are not high quality or fancy, they are simply what the average thrifty family bought to use. When they break, I do feel a bit of sadness but it’s the usual sadness of losing a dish. Knowing their history actually makes it easier to deal with the loss. I know that they served their purpose and am thankful to have been able to continue that on just a little longer instead of leaving them in a box useless in my parents’ garage. While some things taken from my grandparents’ house are being used, there are others that I have not fully utilized. One of these is a loaf pan. My grandmother baked lots of breads and she had stacks of loaf pans. I personally don’t make bread but my husband does from time to time so I thought we would like to have some of her pans. His bread-making hobby has languished lately, but he’s never used the loaf pans (he makes round loaves on a cookie sheet instead). One of the pans has been sequestered by our LO who loves to rummage through any kitchen cabinets she can get into when we forget to lock them. It’s been floating around in the toy flotsam for a few weeks. Recently, I’ve been paring down her toys and I spotted the pan and started thinking about it. It’s always piqued my curiosity because indented into the bottom, it says “Bake King, pure aluminum, No. H822.” And I always wondered if that made it a preferable baking pan. Is aluminum a good baking pan material? However, one thing I did learn that applies to more general baking skills is that it does matter which kind of pan you use depending on the recipe. I’m not sure if this is completely true but the post is full of tidbits that make sense to me. While the blogger never specifically mentions baking regular breads, this snippet echoes what I’ve seen elsewhere online. And many breads are baked at a high temperature for a short time, so I think aluminum sounds like a good option for baking breads. I was unable to find any information online about the company, but this is probably because there are other companies called Bake King that are clearly not the same one. It’s hard to fault anyone for using such a clever name. However, there does appear to be a market for their vintage pans. Ten dollars doesn’t seem like it’s worth it to go through the hassle of trying to sell mine, but I do find it interesting that it’s the same price as a brand new non-coated aluminum loaf pan. You see, aluminum as it relates to bakeware is only released if you scratch it. This I remember quite vividly from college Chemistry class. Therefore, when removing cookies and the like from your aluminum bakeware, just take care not to use metal utensils that can easily scratch the aluminum and release this metal into your food. Wooden spatulas would be the best choice for handling the food when working with aluminum. There also is no risk from aluminum vapors when baking with aluminum bakeware. The heat used for at home baking is not nearly high enough to cause inhalation dangers like what workers at aluminum plants experience. Heating of aluminum must approach its melting point for vapors to be released (1220 F). My oven doesn’t even get that hot when on “self cleaning” mode. First, let’s put this myth to ­­rest: Aluminum pots and pans are perfectly safe. About half of all cookware is aluminum, usually coated with a nonstick ­surface or treated for some other ­purpose. And because stainless steel conducts heat so unevenly, most stainless cookware has an aluminum or copper bottom, anyway. Aluminum is the most abundant metal on the surface of the planet; it’s found in water, food, and common medicines such as aspirin and antacids. We ingest a tiny amount daily. If aluminum pots (or copper pots, for that matter) are untreated, they will react to cooking highly acidic foods such as tomatoes or sauerkraut. This may cause corrosion of the surface and allow a minute amount of aluminum to be released, but less than even an aspirin may contain. Aluminum toxicity requires ingesting or inhaling large amounts. If you want even more information, including why we were worried in the first place, this is a great article. 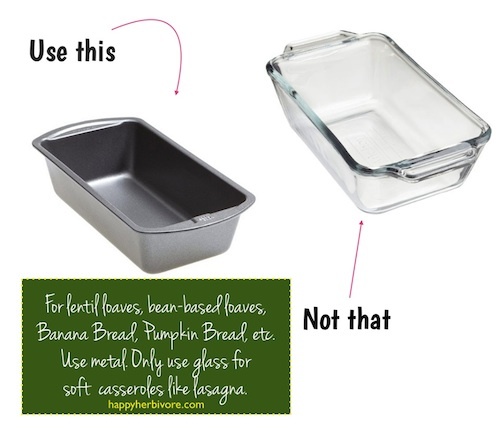 So I’ll keep my vintage aluminum loaf pan around, even if it’s only ever used as a toy. Who knows, I might want to try my hand at making bread someday and this would be a great pan to use.